I had so many questions. How is it possible that such a tiny creature could make such an impossibly large and complex structure? And how long did it take? And is he dangerous? And should I be killing him instead of just snapping photos? On the last question, I punted. 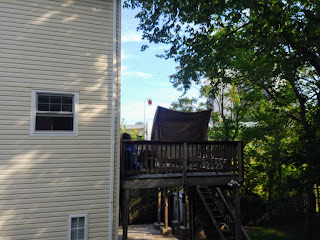 I opted to step back inside for breakfast and to deal with Mr. Spider on a full stomach. Less than an hour later I stepped back outside to assess the situation. And I found...absolutely nothing. There wasn't the tiniest trace of the web. Had I neglected to grab photos, there would have been no proof of this remarkable structure and its creator. So what does it all mean? Life is fragile? Be glad you're not a spider living a backyard full of birds? Take the pics, then eat breakfast? Truthfully, I'm not really sure. But it must mean something, right?